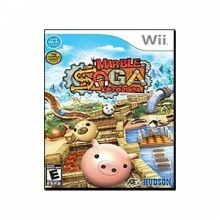 “Marble Saga: Kororinpa” is the sequel to the original Kororinpa for the Nintendo Wii, which was a pretty awesome game. The theme: An ant by the name of Anthony has to save his village. To do so, he has to roll his marble all over the place in an attempt to find a special seed. The controls: Similar to “Super Monkey Ball”, players control the world instead of the marble itself. In this particular case, the Wiimote is used to tilt and twist the world in order to guide the marble around. That’s really all there is to it. I had no issues with the controls, personally. The graphics: The visual appeal of this game is hard to deny. The graphics are very smooth and the textures are very clear. Jagged edges are visible in the distance, but it’s not too big of a deal. The framerate is also very constant in the single player mode, while it can drop a bit during intense multiplayer sessions. Lighting and shadows are particularly nice, which is an obvious help and makes the graphics pop out a bit more. The gameplay: As basic as the gameplay is, it’s very, very addictive. There seems to be a nice bit of variation even in the preview build. There’s not a lot to be said about the gameplay itself because it’s quite simple. You roll around, collect gems, look for the goal and move onto the next level. Unlockable marbles are also obtained by completing levels, which also adds a little bit of customization and flavor to the game. There’s also a multiplayer mode designed around the idea of racing, which supports up to 4 players via single television splitscreen. There’s no online play to be seen, at least in the preview build, but the multiplayer is still very fun with friends and family. The bottom line: I had a lot of fun with this and I look forward to playing the full version when it’s released, which is said to have over 150 full single player levels and a bit more variation with the multiplayer races. It controls well, it looks nice, it has a lot of content and it sounds good. Look for “Marble Saga: Kororinpa” on store shelves this spring.